Bogue Banks is the perfect vacation spot any season, but the fall months allow for secluded days by the sea. The hot summer sun gradually gives way to gentle fall breezes, creating impeccable weather for great outdoor activities. 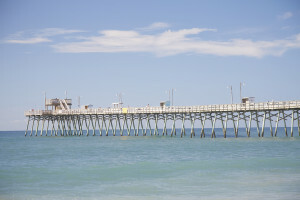 Bogue Inlet Pier, catch anything from Wahoo to King Mackerel, Speckled Trout to Red Drum. The pier is not only a great place to fish, it’s also the perfect spot for a relaxing stroll to enjoy the views of the Atlantic Ocean from the observation deck. 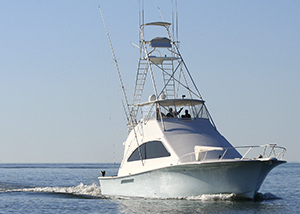 Cast your line a little deeper upon one of the many expert deep-sea fishing charters available in Emerald Isle and its surrounding beach communities. From small and intimate boats to large powerful fishing vessels, there’s something for every fisherman, or woman. And with the warm waters of the Gulf Stream being so close to our shore, the big one is definitely out there waiting for you! 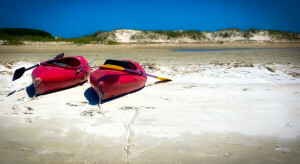 Grab your paddles and head out for a day of kayaking on the Outer Banks. Bring your own kayak or browse local kayak rentals, then cast off from the shallow waters of Bogue Sound, a perfect spot for beginners. Or take advantage of one of our soundfront condo rentals, which allow you to launch right from the docks. Kayak fishing puts you in very close proximity with nature and the catch you’re after. During the fall, it’s common to haul in black drum, sometimes weighing in at almost a hundred pounds. Once its colder, you’ll find some of the best striped bass and speckled trout that the Crystal Coast has to offer. And you’ll find redfish or red drum year-round. If you’re not into fishing, there are many guided kayak tours available to make sure you soak in all the scenic beauty and wildlife this area has to offer. Experienced guides will wind you around islands and marshy mazes, exploring the area and its history. A vacation isn’t complete unless you find the perfect souvenir to remember it by. And there is nothing more special and authentic than a treasure from the deep, a beautiful unique seashell. And with less beachgoers in the cooler months, you’ll have your pick if the best ones on the beach. except for the shells. You can expect to discover large specimens, such as helmet conches and varieties of big moon shells. Take a free ferry ride from Hattaeas to Ocracoke Island, the shining star of Outer Banks shelling. Although its at the southernmost end of the Outer Banks, the shells there and the area’s wild beauty make it worth the trip. With 16 miles of shore to comb, you’re sure to find the perfect seashell. 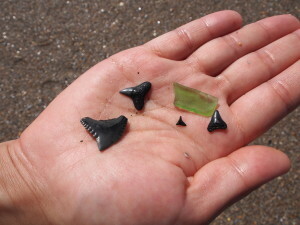 If you’re really lucky, you might be abl to uncover shark’s teeth and sea glass. Another hotspot for shelling is Cape Lookout National Seashore, just to the south of Oracoke Island. Home to the Cape Lookout Lighthouse, you can find an abundant amount of Scotch bonnets, the state shell of North Carolina, after a big storm. Stay exclusively on dry land and go biking along the Crystal Coast. Whether you’re a beginner cyclist or an experienced mountain biker, there are numerous bike trails to choose from, including the Emerald Isle bike path. Explore some of the area’s outfitters that offer bike rentals and experience a different side of the Outer Banks. For the ultimate experience during your off-season excursion, plan a Crystal Coast eco-tour that lets you see everything from barrier islands to marshes. Experience the treasures of the Crystal Coast through shelling, clamming, birding, snorkeling, or dolphin and wild horse watching. There’s so much to discover, whether your eco-tour is two hours, a half day or a full day of exploration. The off-season on Bogue Banks is an incredible way to experience the many adventures of the Crystal Coast without the hustle and bustle of the summer season. Find specials on nightly rentals available during the off-season, or check out our winter monthly rentals in Emerald Isle that you can rent by the month. The rates may be low, but you can set your expectations high!